President Nicos Anastasiades has urged eurozone leaders to revise the terms of Cyprus’ bank bailout, in a highly critical letter. Nicos Anastasiades said the “haircut” imposed on large deposits under the 10 billion-euro bailout had significantly eroded the capital kept by businesses in banks. The letter to Cyprus’s creditors, sent last week, was leaked on Wednesday. 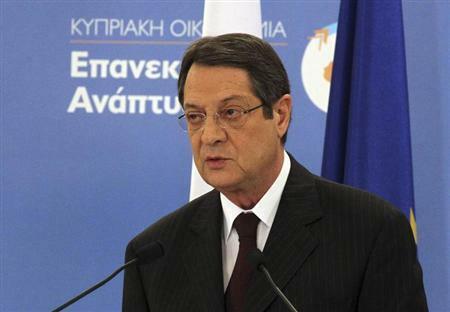 “I urge you to support a long-term solution to Bank of Cyprus’ thin liquidity position,” Nicos Anastasiades said. Laiki Bank is being wound up and its safe assets transferred to BoC. For large depositors at both banks the first 100,000 euros is protected, but the government can tap up to 40% of their remaining deposits, to contribute billions towards the bailout. But Nicos Anastasiades complained that “no distinction was made between long-term deposits earning high returns and money flowing through current accounts, such as firms’ working capital”. The rescue was agreed in March with the troika of international lenders – the European Commission, European Central Bank (ECB) and International Monetary Fund (IMF). Capital restrictions imposed to prevent a run on Cypriot banks have been eased, but remain in place. The president said such “artificial” measures “will only aggravate the depositors the longer they persist”. “Rather than creating confidence in the banking system they are eroding it by the day,” Nicos Anastasiades warned. The text of his letter appeared on the Open Europe think tank’s blog on Wednesday. His complaints about the bailout were also reported by the Financial Times. Unnamed eurozone officials quoted by Reuters news agency say there are no plans to alter the terms of the bailout for Cyprus or to supply more funds. Eurozone finance ministers will discuss the letter at a meeting in Luxembourg on Thursday, Reuters reports. Cyprus has started receiving installments of the bailout package from international creditors.